It’s hard not to enjoy seconds of these Spicy & Sweet Miso Glazed Sweet Potatoes with a sprinkling of hemp hearts. They are just so tastebud tantalizing that we’ve enjoyed them on weekends and are looking forward to adding them to our holiday table! I don’t think I’ve eaten as much, learned as much, or talked as much in three days as I did during the #HelloSprouts retreat last week. 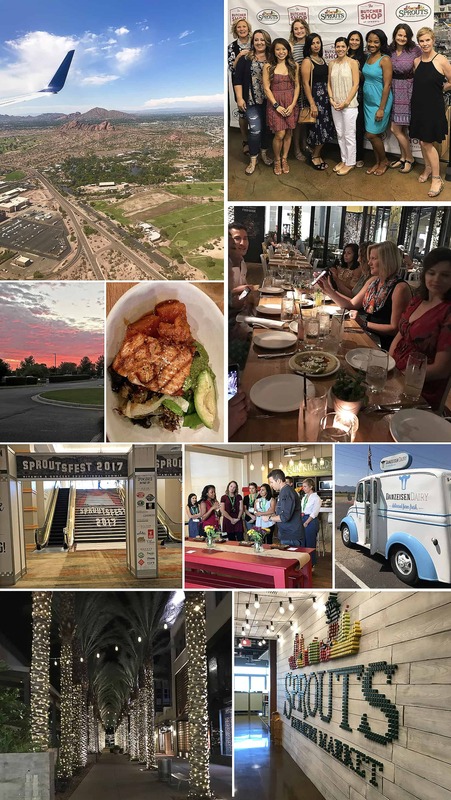 It feels like it was forever ago, but it was only last week that I spent 3 fun days with 9 amazing bloggers in Phoenix at a blogger event sponsored by Sprouts in Phoenix, Arizona. During those 3 days, we got to sit in on a few informative sessions on brain health by Dr. Perlmutter and soil health by Kyle Garner, at SproutsFest. SproutsFest is an educational summit where Sprouts team members and vendors meet up to go over products (that are being sold and are to be sold) in the Grocery, Dairy, Frozen, and Vitamin & Body Care departments – at Sprouts. SproutsFest also includes table top shows where vendors let you sample their goodies. I think I brought back three bags of stuff to my hotel room one day, while I’ve shared some of them on my Instagram stories, I will share some more in another post on here next month. But it wasn’t all just learning, we had a few fun contests – one was an Instagram challenge, a “romance-copy” challenge, a gift basket challenge and a chopped-style, “mystery box” challenge! There were also several presentations by vendors who partner with Sprouts such as Garden of Life, Aura Cacia Pure Essential Oils, Organic India and DanoneWave representatives – with the reps from DanoneWave letting us play around with a vast line of their plant based products and cold brew coffee to come up with cold brew coffee elixirs as well as indulgent drinks. There were also trips to Danzeisen Dairy and a Sprouts Healthy Communities Foundation. And, when we weren’t learning or engaging in fun contests, we were eating! There were so many delicious meals like shabu shabu and a bruschetta platter party! I will share more about some of the meals over the next few months – but today I want to share these Spicy & Sweet Miso Glazed Sweet Potatoes with y’all. These Spicy & Sweet Miso Glazed Sweet Potatoes were inspired by the Ancient Grains Bowl I enjoyed on my first night in Phoenix when Sprouts took us to True Food Kitchen for dinner. 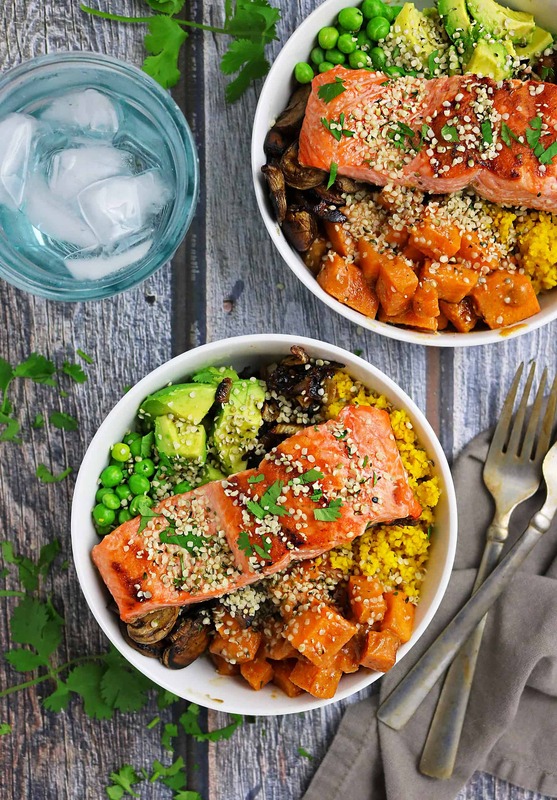 The bowl was filled with avocado, caramelized onions, crispy fried mushrooms, ancient grains, steelhead and delicious miso glazed sweet potatoes. While my rendition isn’t exactly like the one I tasted at True Food Kitchen – it is close aaaannnnd…my daughter couldn’t get enough of these Spicy & Sweet Miso Glazed Sweet Potatoes (which is my ultimate test)! In fact, she asked me to make her a second batch to take back to college with her. And, all this week, she has been rationing them out so she has some to enjoy every day. My Spicy & Sweet Miso Glazed Sweet Potatoes are not as sweet as the ones I had, and they have a slight spice kick that wasn’t part of the original. 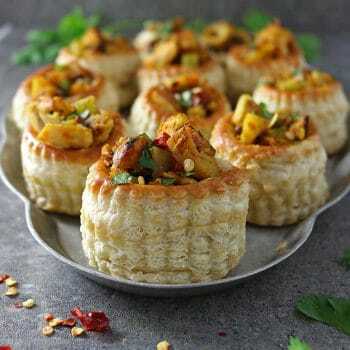 But, they are so irresistible and so easy to make! 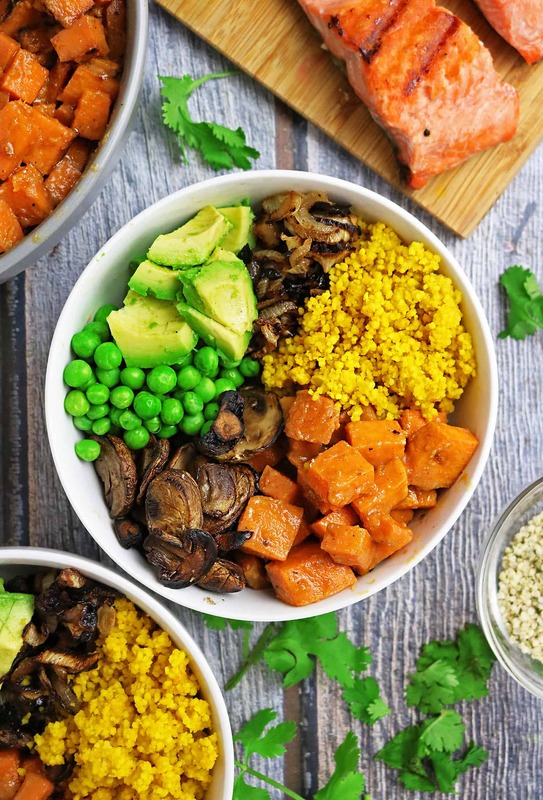 My daughter and I enjoyed these Spicy & Sweet Miso Glazed Sweet Potatoes with turmeric couscous (simply couscous cooked in turmeric and water and seasoned with salt and pepper), caramelized onions, crispy pan fried mushrooms, salmon seasoned with salt and pepper, avocado, and green peas. 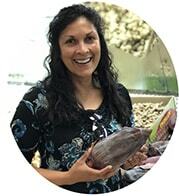 When I got back to Atlanta, I headed to my local Sprouts Farmers Market to pick up all the ingredients – even the white miso paste (which I found in the refrigerated section near the dairy items). Then, I headed home and whipped these Spicy & Sweet Miso Glazed Sweet Potatoes up. 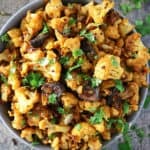 These were so good that my daughter and I are thinking we might have to make this dish a must at game day get-togethers, weekend dinners and, even at our holiday table! 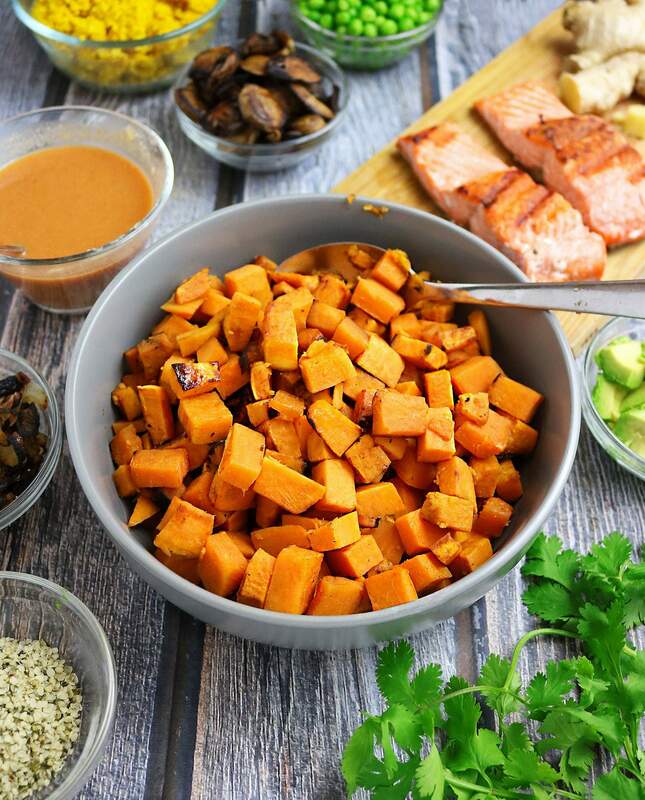 Maybe you could head to Sprouts to pick up the ingredients and give these Spicy & Sweet Miso Glazed Sweet Potatoes a try? And, if you don’t have a Sprouts Farmers Market near you, Sprouts has now partnered with Amazon Prime for delivery service. 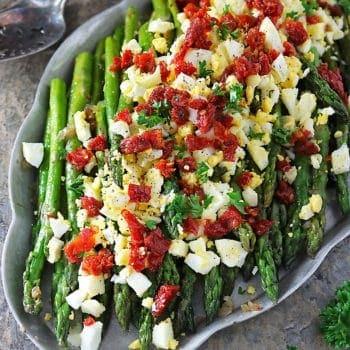 Through Amazon Prime, you can now get your entire grocery shopping list including fresh organic produce, meat and seafood from Sprouts Farmers Market delivered right to their door with one hour ($7.99) and free two-hour delivery between 8 am and 10 p.m.
Add olive oil to a pan over medium heat and when it heats up some, add sweet potatoes to it and toss well. Then cover and let saute for about 5 minutes. Uncover and toss and saute another 5 minutes. 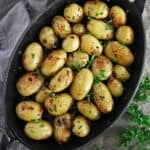 Gently poke sweet potatoes with a fork - if they seem tender, take them off the stove - if not, let cook another couple of minutes covered. Set aside and let cool slightly. 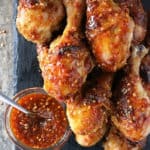 Meanwhile, make the Spicy Sweet Miso Glaze by adding the soy sauce, miso, vinegar, water, ginger, agave, and sriracha to a bowl and mixing well with a spoon - till all ingredients are well incorporated. 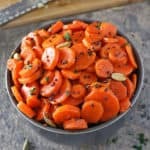 Pour over the slightly cooled sweet potatoes, sprinkle with hemp hearts and enjoy. 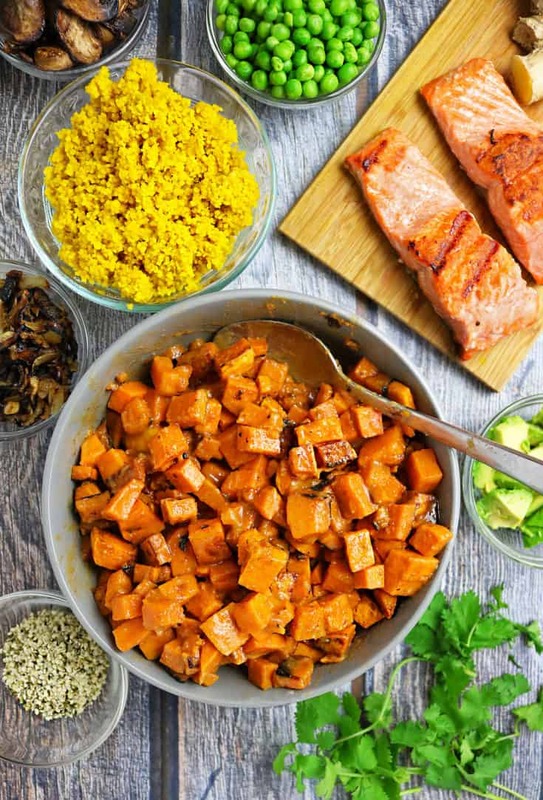 *You can enjoy this Spicy & Sweet Miso Glazed Sweet Potatoes with turmeric couscous, caramelized onions, crispy pan fried mushrooms, salmon seasoned with salt and pepper, avocado, and green peas like we did - or simply as a side with anything else you are making for dinner. Sounds like a fun and informative event! 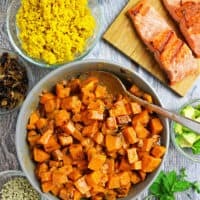 I love the sweet and spicy sauce for the sweet potatoes and it’s perfect with a bit of salmon on top! 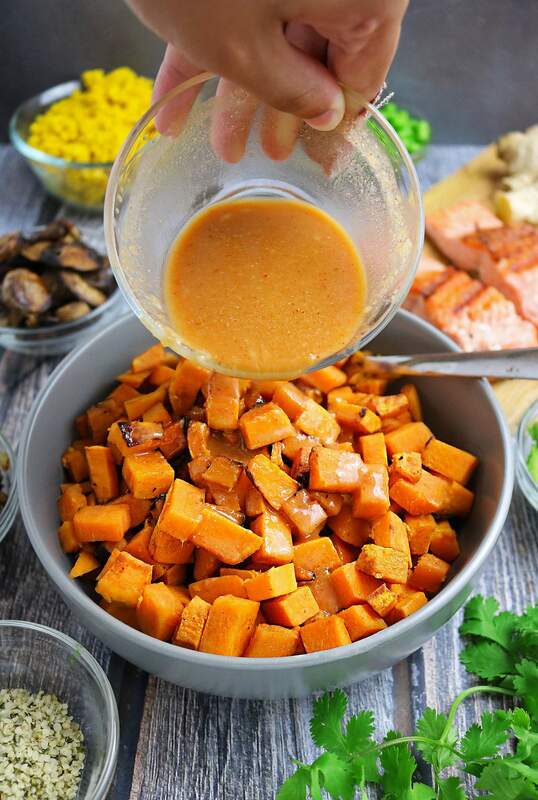 I’ve never heard of white miso paste, t his looks like a yummy oriental twist on sweet potatoes. My husband also loves cooking things (usually rice) in turmeric to make them yellow. Oh wow! 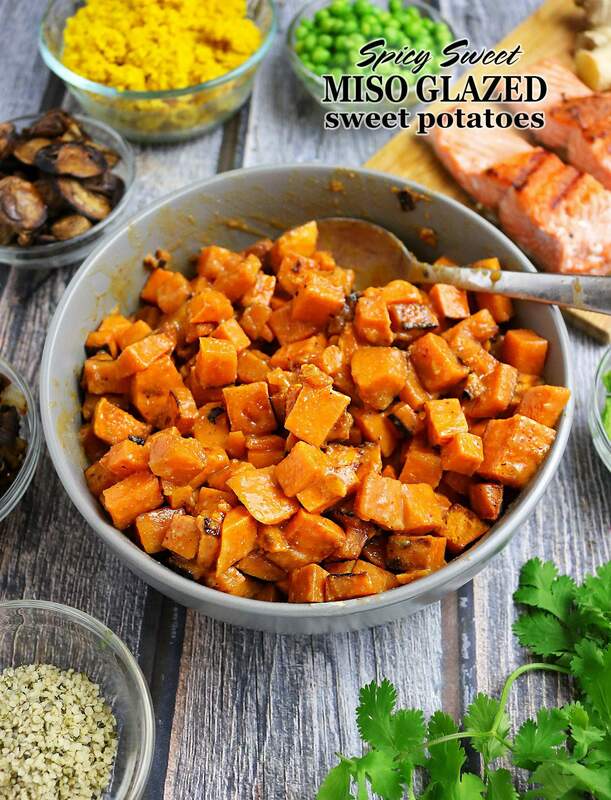 These sweet potatoes look so glorious and delicious! Beautiful photos! It all looks so delicious and satisfying! That is quite delicious and it must have been quite a lovely experience in Phoenix!!!! I absolutely love the snack bins at Sprouts and just about everything else in their store too! Time for another visit, looks like. I’m fresh out of white miso. These sound soooo tempting. I would love to try them in a grain bowl topped with some salmon like that! How awesome is it that Sprouts has partnered with Amazon Prime?! I keep hoping Sprouts will open up a store here in upstate New York, but now I’ve got the Amazon Prime option. Now if only I could figure out how to get Savory Spin to sell meals on Amazon Prime…hmmm. 🙂 These glazed sweet potatoes sound delicious, and I would be all about the dish as a whole. Plus, that really does look like an amazing holiday table there in your photos! 🙂 SproutsFest sounds like it was an amazing good time, and I’m so happy that y’all had so much fun out there. Thanks for the photos and the recipe inspiration, my friend!